One of the major problems plaguing Nintendo’s image right now is their lack of ambition for online multiplayer games. Games such as Nintendo Land and 3D World were offline-only in favor of an “NES-like experience”. And when a Nintendo games comes out that does have online multiplayer, it’s usually lacking in standard online features. 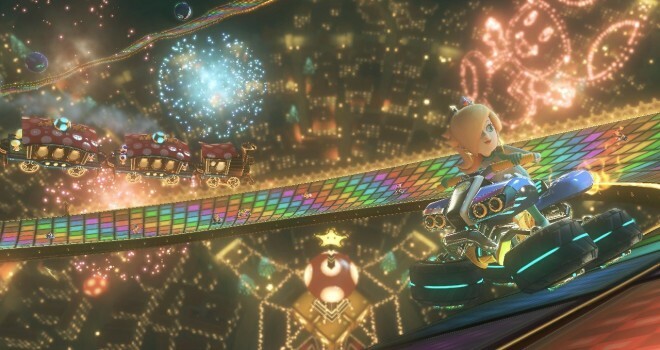 This may not come as a surprise to most, but the news is still extremely disappointing nonetheless; voice chat appears to be absent in Mario Kart 8. Heading over to the Wii U eShop, Nintendo has already put Mario Kart 8 up and all the information about it is listed. Clicking on the game and scrolling down the page, you’ll see the section titled “Compatible Features/Accessories”. Under the “Supports Online Play” sub-category, online multiplayer, leaderboards, and Miiverse are listed. This is the section where “Game Chat” is listed if a game supports voice chat, but it’s missing from Mario Kart 8’s features list. I could understand omitting voice chat for random, public matches, in order to keep the kiddos safe (though, I still feel that that is the parent’s responsibility and not Nintendo’s), but there’s no reason to exclude it from private games with friends. To be honest, I don’t care much for speaking to random strangers in my online games, so I can do without voice chat with then. But if I can’t speak to my friends, how can I tell them to “hang on” if I have to go use the restroom? How can I tell them that the next match will be my last race? I can’t. Fans who would love voice chat in Mario Kart should start asking and pushing for it now while there’s still time. The game doesn’t come out until May 30th, so maybe that will be enough time for Nintendo to implement such a simple feature. Otherwise, private games are going to be a little hindered. Leave us your thoughts down below. Meh, People with no friends need VoiceChat, they probably just skype with randoms coz they ain’t got alotta real friends, real talk… Long as theres online to whoop peoples asses, thats cool……..
Aren’t you jumping the gun with this a bit? They’ve intentionally been tight-lipped about online since the embargo so I would expect they wouldn’t be so careless as to leak information via the eShop. @RadioNintendo @GaminRealm I think they’ve jumped the gun on this one, and there’s no way it could be added in time. Dude, he’s lying. There IS voice chat. Go check the features for the game on the eShop. I love this game it is really very interesting it is good thanks for sharing with the post.